The University Medical Center Schleswig-Holstein (Universitätsklinik Schleswig-Holstein, UKSH) is one of the largest tertiary health care providers in Germany. Within the “Endocrine Center North“ („Hormonzentrum Nord“) a total of 14 institutions are joined to offer highly specialised endocrine care of highest quality. The UKSH is located in 2 cities at the Baltic sea, Lübeck, Germany, and Kiel, Germany. 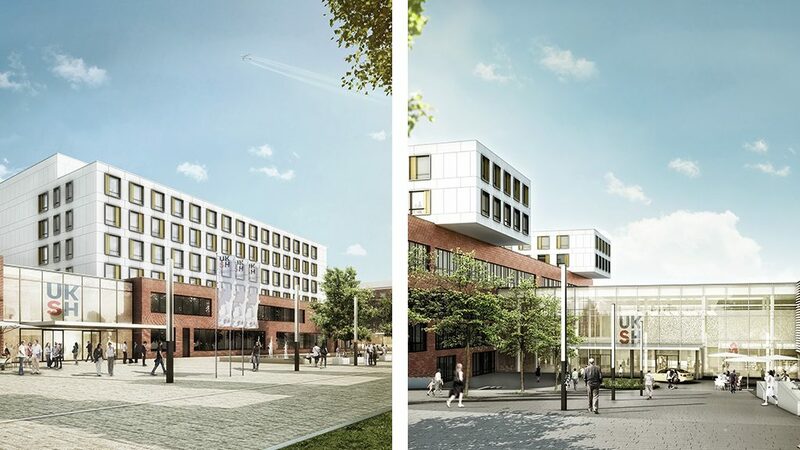 At both sites, investment of more than 600 million Euros will lead to one of the most modern and patient-oriented University hospital building structure in 2019 (Fig 1 and Fig 2). Within the “Endocrine Center North“ multidisciplinary expertise is united in provision of care for the entire spectrum of endocrine conditions. The centre is closely linked with the University of Lübeck, Germany, and the Christian-Albrechts-University of Kiel, Germany, which is a prerequisite for excellent translational and clinical research and education of medical and non-medical students and professionals. Highly specialised multidisciplinary teams offer health care across the lifespan of the patients within the areas of expertise. Excellent diagnostic services include highly specialised laboratory and genetic analyses and expertise that is utilised by local, national and international senders with clinical queries and biosamples. The UKSH is providing health care to patients from all over the world. Management of cross border patients is led by the International Department according to clear policies and procedures. In the field of DSD the HCP has implemented distinct standards of operation for diagnosis and management (Hiort et al., Nat Rev Endocrinol 2014), has been actively participating in the development and implementation of (inter)national guidelines and has been actively involving patient support groups in this work. The medical professionals have been leading international research, chairing the FP7 funded research project “EuroDSD”, which has led to the implementation of an international database for patients with DSD, and currently the pan European network DSDnet, which is funded as a COST Action through Horizon 2020. Moreover, collaborative DSD related research projects in this HCP have been continuously funded by the German Research Council (Deutsche Forschungsgemeinschaft, DFG) and the German Ministry for Research and Education (Bundesministerium für Bildung und Forschung), BMBF) for almost 2 decades. They are actively participating in the FP7 funded outcome study“DSDLife”. Currently the HCP is implementing a centre for DSD according to criteria developed by the “NAMSE” (national alliance for people with rare diseases), which are based on the recommendations of the German Ethical Committee and the German Chamber of Physicians. The HCP has actively participated in the development of these recommendations. With the expertise in calcium and phosphate homeostasis the HCP is participating in the international consortium EuroPHP for rare cases of Gsalpha signalling disorders. It offers highly specialised diagnostics both in biochemistry and genetics and the multidisciplinary team manages patients on an (inter)national level with special expertise through regular laboratory assessment. Further focus is on the laboratory investigations and treatment of hypophosphatemia in childhood and adolescence. The HCP’s Thyroid Centre has been long established with an interdisciplinary approach to the whole spectrum of thyroid disorders and regular centre meetings. It has been participating in the DFGSPP 1629 Thyroid Trans ACT Translation of Thyroid Actions beyond Classical Concepts, dedicated to finding novel biomarkers and better treatment options for patients with thyroid hormone related disease and providing a unique platform for basic science and clinical training of junior scientists and doctors in the field. In the field of rare endocrine tumour syndromes an on-site patient register and weekly tumour boards have been implemented. Institute for Pathology Lübeck (DIN EN ISO 17020:2004, DAkkS) as a cooperating partner. The Department of Radiology and Neuroradiology, the Department of Nuclear Medicine, Imaging and Therapy and the Department of Neurosurgery in Kiel are certified according to DIN EN ISO 9001:2008. Certification for the Department of Radiology and Neuroradiology Lübeck according to DIN EN ISO has been prearranged.